The Advanced Crew Vehicle will carry six crew members and 1,100-pounds of cargo. Russia's next new manned spacecraft will launch atop a different rocket than planned, one originally designed for only robotic spacecraft. The country's new six-cosmonaut spacecraft is due to lift off on its first test flight in 2018, using a launcher named Angara A5 developed for unmanned missions. The new six-cosmonaut spacecraft, which is called the Advanced Crew Vehicle (ACV), was to have been launched by another new rocket, Rus-M. The Rus-M was to be an evolution of the Samara Space Center's Soyuz FG rocket that launches the Soyuz manned spacecraft. But Rus-M was canceled last year, while ACV was continued despite no launcher being identified for it. As well as carrying six cosmonauts, the ACV will carry 1,100 pounds (500 kg) of cargo and could travel to the moon. Like the Soyuz capsule, which Russia currently uses to launch humans to orbit, the ACV will use rockets to land. Soyuz is launched from the Baikonur Cosmodrome in Kazakhstan, and Angara will fly from the planned Baiterek facility, also at Baikonur, after its first few flights from Plesetsk Cosmodrome in northern Russia. Vladimir Popovkin, Russia's Federal Space Agency director general, told SPACE.com, "The main launcher for the new spacecraft will be Angara," after explaining that earlier testing of the spacecraft’s technology, such as its launch escape system, will use the Ukrainian Yuzhnoye Design Bureau’s Zenit rocket. The Angara A5 will now be human rated to carry the Advanced Crew Vehicle. 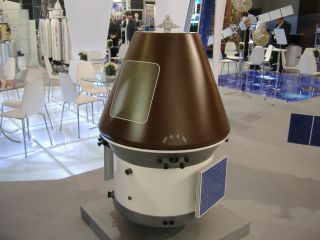 Popovkin spoke to SPACE.com at his space agency's exhibit at the Farnborough International Airshow in Hampshire, England, which took place July 9-15. On exhibit by the Russian agency were scale models of the ACV and an Angara A5 and ACV stack with its launch escape system. He added that Angara rocket technology has already been tested. South Korea’s Korea Space Launch Vehicle (KSLV) uses it for its first stage, which is provided by Khrunichev State Research and Production Space Center, Angara’s prime contractor. On KSLV's maiden flight in August 2009, the vehicle's first stage was successful but the Korean-made upper stage failed. That upper stage failed again a year later on the second flight. Later this year the third launch of the KSLV will take place. The first launch of the Angara family is scheduled for 2013 — years later than originally planned. The Angara family has been in development since the 1990s but funding problems have delayed its entry into service. This year's first flight will see the smallest of the four, the A1.2, fly. Using one core, the A1.2 liftoff weight is 376,000 pounds and the payload capability for a 124-mile orbit is 8,300 pounds. There was a smaller Angara, the A1.1, with a 4,400-pound payload ability, but plans for that vehicle have been canceled. It and the A1.2 were supposed to fly by 2011. There is a super-heavy version of Angara, the A7, in the works. This has a 2.4 million-pound liftoff weight and its 124-mile orbit payload capability is 77,000-pounds.